It is September 1998 and the action focuses on the ill-fated Raccoon City and the horrific consequences of the deadly T-virus outbreak, developed at the Umbrella facility. With a cover up required, Umbrella orders an elite team into Raccoon City to destroy all evidence of the outbreak and eliminate any survivors. Meanwhile, the US Government has quarantined the city and dispatched its own team of elite soldiers to determine the source of the mysterious outbreak. You are an Umbrella Security Services soldier (U.S.S. 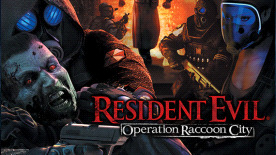 ), competing alone or in up to four player co-op in a battle against all the competing forces at play in Raccoon City. Expect the return of original Resident Evil enemies, iconic landmarks such as the Raccoon City Police Department and fan favorite characters, including Leon S. Kennedy, who, as a rookie police officer in Raccoon City, is on your hit list to eliminate. ©CAPCOM CO., LTD. 2012 ALL RIGHTS RESERVED. Windows, the Windows Start button, Xbox, Xbox 360, Xbox LIVE, and the Xbox logos are trademarks of the Microsoft group of companies, and “Games for Windows” and the Windows Start button logo are used under license from Microsoft. The ratings icon is a registered trademark of the Entertainment Software Association.